Turkey, Iran and Russia agreed on holding a Syrian People's Congress to find a permanent solution to the Syria crisis, while Turkey reiterated its determination on excluding PKK-affiliated groups from the process, designating the matter as its "red line." The presidents of Turkey, Russia and Iran came together at the Rus Sanatorium in the Russian coastal city of Sochi to discuss a permanent political solution to the Syrian civil war, which has entered its seventh year and has claimed at least 400,000 lives, according to human rights organizations. In a press conference held after the meeting, President Recep Tayyip Erdoğan ruled out attempts to include the PKK's Syrian offshoot PYD in the Syrian peace process, saying that no one should expect Turkey to sit at a negotiation table with a terrorist group that "poses a national security threat" to the country. 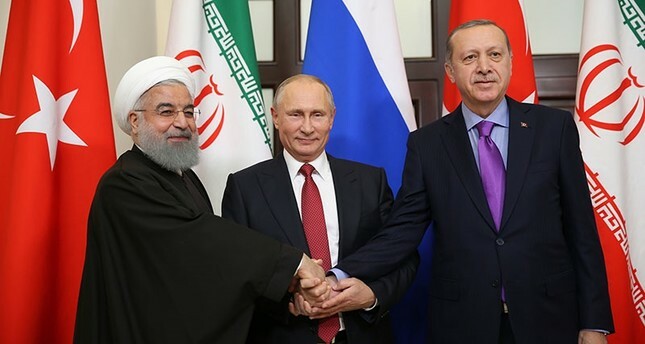 Speaking after meeting his Turkish counterpart Recep Tayyip Erdoğan and Iran's Hassan Rouhani, Russian President Vladimir Putin said the three leaders have instructed their diplomats, security and defense bodies to work on the composition and date of the congress. Syria's leadership is committed to the peace process, constitutional reform and free elections observed by the U.N., Putin said after the trilateral meeting held in the southern Russian city of Sochi. The three presidents agreed to step up efforts to finish off "terrorist" groups in Syria, he said. For his part, Erdoğan said Turkey, Russia and Iran had reached a consensus on an "inclusive and fair" political transition process in Syria. Turkey also reiterated its determination on excluding PKK-affiliated groups from the process, designating the matter as its "red line." Erdoğan warned that Turkey prioritizes the exclusion of terrorist elements [PKK's Syrian offshoot the Democratic Union Party (PYD) and its armed wing People's Protection Units (YPG)] from the resolution process in Syria, and that the country will not be under the same roof with terrorists who undermine its national security. He called on the international community and stakeholders in Syria to support the three countries' efforts to resolve the crisis. The three presidents came together at the Rus Sanatorium to discuss a permanent political solution to the Syrian civil war, which has entered its seventh year and has claimed at least 400,000 lives, according to human rights organizations. In the brief news conference before the meeting, Putin said: "It is obvious that the reform process will not be simple, it will require compromise and concessions from all parties, including obviously the Syrian government." He added that he is proposing to discuss "parameters of Forum of Syrian Dialogue" on the same day. He called on other leaders to continue helping to restore Syria by developing a long-term comprehensive program, considering the "colossal scale of destruction" that the country has endured. The Russian president also hailed the special role Erdoğan and Iranian President Hassan Rouhani played in the Astana peace process, saying that military action in Syria would not end otherwise. Erdoğan said that he believes critical decisions are to be taken today at Sochi regarding the ongoing Syrian crisis. He noted that the current progress regarding the crisis is significant but is not sufficient, adding that all sides need to contribute to find a political solution that will be embraced by the Syrian people. Rouhani stated that the basis to establish peace and stability in Syria has been prepared. "Terrorism poses danger for every country. We observed this with the Daesh. All three countries clearly expressed their opinions over the issue. A basis will be prepared for the new constitution. There will be a new constitution and new elections will be held. This may bring stability and peace to the whole region," he said. Rouhani also said that he is pleased Turkey, Iran and Russia are cooperating closely on a Syria peace process, adding that ground is prepared for a political settlement for the war-torn country. He also said there is "need to uproot the last cells of terrorism in Syria." Meanwhile, Rouhani also said that foreign military presence in Syria acceptable only if it is by invitation of the Assad regime. Erdoğan also held a bilateral meeting with Rouhani on the sidelines of the summit. The meeting, which was closed to the media, lasted 40 minutes. Ahead Erdoğan's meeting, Foreign Minister Mevlüt Çavusoğlu, Russian Foreign Minister Sergei Lavrov and Iranian Foreign Minister Mohammad Javad Zarif met in Turkey's Mediterranean city of Antalya in Sunday in a preliminary meeting to discuss details that were expected to be on the agenda. Also, Chief of General Staff Gen. Hulusi Akar went to Sochi on Tuesday to meet with Russia's Chief of Staff Gen. Valery Gerasimov and Iranian Chief of Staff Maj. Gen. Mohammad Bagheri ahead of the Sochi summit. Turkey, Russia and Iran are the guarantor countries that brokered a cease-fire in Syria in December 2016, leading to the Astana talks, which are running parallel to the Geneva talks for peace in Syria. The three countries have carried out negotiations in the Kazakh capital since and agreed on the formation of five de-escalation zones in Syria.